Papers: In the Robert Watts Hudgens Papers, 1925-1973, approximately 6,400 items. Persons represented include James Prioleau Richards. Papers: In the Stella Brunt Osborn Papers, 1916-1992, 40 linear feet. Other authors include James Prioleau Richards. Papers: 1932-1974, 10 linear feet. 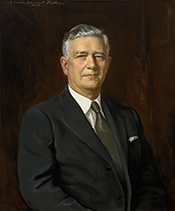 Collection consists of material relating to James Prioleau Richards’s representation of South Carolina’s Fifth Congressional District, 1933-1957, including his interest and expertise in foreign policy, as well as his service as Special Assistant to President Eisenhower for the Middle East, 1957-1958. Includes information on his membership on the Joint Committee on Foreign Economic Cooperation Administration. Series include Correspondence, Topical Files, Photographs, and Newspaper Clippings. Further information and finding aid available at: http://www.sc.edu/library/scpc/richards.html. Lee, Joseph E. "'America Comes First With Me': The Political Career of Congressman James P. Richards, 1932-1957." Ph.D. diss., University of South Carolina, 1987. Richards, James P. "The House of Representatives in Foreign Affairs." American Academy of Political and Social Science, Annals 289 (September 1953): 66-72.